Count Vlad’s Castle in Romania. Dr. Paul S. Howard visited Romania several years ago to operate on orphaned children born with facial deformities. Author Anne Rice benefited from the allure of the Vampire in pop culture where there has always been a certain interest in all things Romania. From Count Vlad “the Impaler,” to the gypsy culture and even gymnast Nadia Comaneci have all fueled interest in the darkest of the former Eastern Bloc Soviet satellite countries. Our fascination with Romanian people may stem from their unique Eastern European history. The Romanian is proud of his Dacian ancestry making their culture and language more like that in Rome than their geographic neighbors which are Slavic countries such as Hungary, Serbia, Moldavia, and Bulgaria. 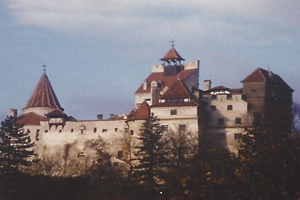 The myth that is Dracula has a basis in fact steeped in the history of Romania and the Dark Ages of Europe. Vlad III, Prince of Wallachia, member of the House of Draculesti, known by the patronymic name Dracula was born in Transylvania in 1431. The translation of the name Dracula comes from his father Vlad Dracula, meaning “dragon” or “devil.” Vlad III was known in his adult life as the son of the devil. It was only after his death in 1476 that he became known as “tepes” or “the spike,” alluding to his famous battles with the Islamic Turks and his father’s battles with the Boyer Family for the thrown of Wallachia. Both the Boyers and the Turks were “spiked” or impaled as punishment and as a deterrent. Thus, Vlad “The Impaler” was born. It was left to the Irish author, Bram Stoker, to rekindle the Dracula legend as well as embellish it to include the Vampire myth in his 1899 gothic horror novel, Dracula. The recent fascination with the Vampire myth was stoked by any number of books including those by Ann Rice and the TV series Vampire Chronicles. It comes as no surprise that medical marketing would jump into the Vampire craze even though the institution of Vampire tales is beginning to wear thin even in pop culture. We now have a non-surgeon entering the pop-culture marketplace with the so called “Vampire Facelift™.” The connection with vampires is interesting in that vampires are a Gothic myth with no factual basis much like the vampire Facelift™ is more of a New Age myth with no basis in fact. The connection to Vampire culture is through the use of Platelet Rich Plasma (PRP) as an adjunct to the use of temporary foreign fillers (Juvederm™, Restylane™) to effect some sort of facial rejuvenation akin to the well-worn “Liquid Lift™. Fillers plus PRP equals the Vampire Facelift™. Platelet Rich Plasma is obtained by drawing blood from the patient’s arm (not the neck as in vampire-lore), and by processing the blood one obtains platelet poor plasma (PPP) and platelet rich plasma. The most well-known use of PPP is “fibrin glue,” a soft tissue sealant used in many kinds of surgery. PRP has a bewildering array of uses, but all of the known benefits come from the activation and stimulation of growth factors and cytokines. These are necessary for cellular activity which benefits blood supply, healing and specifically the “take” of fat grafts mediated through the activation of stem cells. Recently it has come to light that activated stem cells and PRP have a beneficial effect on aging skin causing increased collagen synthesis, may be helpful to increase elasticity and is believed to improve skin texture as well. Platelet rich plasma, coming from blood, has many important functions, but none of these functions create volume nor “lift” tissues in any way. Additionally, PRP is very easy to obtain from blood. The actual skill involved is drawing the blood which is easily processed to PRP, is easy to activate with calcium and thrombin, and actually is a source of protein when swallowed (vampire’s diet). Utilization of PRP is a useful adjunct for facial rejuvenation, but in and of itself has not shown to have much of a rejuvenating effect. The addition of temporary fillers does not improve what is already known about the temporary volumizing effect of hyaluronic acid based fillers. The two together serve to prove the uselessness of trademark laws as applied to medical science. Dr. Paul Howard is Board Certified by the American Board of Plastic Surgery. There is a movement afoot to try to legislate safety in plastic surgery by controlling what we do rather than taking the more difficult route of controlling the credentials and training of practitioners. State governments must find it less offensive to certain constituencies to legislate what we do and how we do it rather than more directly addressing the office surgical setting by requiring each and every practitioner to have a minimal amount of core training in the procedures legislators deem unsafe. When non-professionals try to address concerns on medical safety it always appears that some group of doctors may be affected and their arguments always seem to be based on possible financial restraints or financial hardships that fully trained and credentialed doctors may not suffer. The implications are that all doctors, regardless of training, are essentially equal. No such assumptions are proffered for neurosurgeons or cardiac surgeons. There is no legislation attempting to equalize specialty surgeons by defining what we do to make the entire group safer. No one has proposed the idea that cardiologists, with little or no surgeon training, should be allowed to do open heart surgery as long as they operate in a safe manner and do the operations in approved facilities. It would seem safer to address the training and credentials of those performing open heart surgery rather than restricting cardiologists to “simple” open heart cases. This is much like restricting non-plastic surgeons to “simple” or low volume liposuction searching for a safety standard by “dumbing down” the operation and its possible complications. In another way, many surgeons and non-surgeon administrators have convinced people that surgery is always safer when performed under general anesthesia with an anesthesiologist in attendance. The fact is that almost all facial plastic surgical procedures done on adults for cosmetic reasons are safer when performed without general anesthesia, and its riskier counterparts, mask anesthesia and monitored anesthetic care. The latter two are basically general anesthesia without the benefit of a secure airway and in facial cases, a difficulty in administering oxygen as needed. It’s easy to declare that all patients need the most sophisticated and complex care in all circumstances with the assumption being that this is the safest way to proceed. One aspect of plastic surgical complications that seems to be consistently overlooked is the general anesthetic contribution to all complications. The fact that general anesthesia is related to complications is found in the surgical maxim that complication rates increase rather drastically after 2 hours under general anesthesia. I don’t believe that operations longer than 2 hours are inherently more dangerous. Many surgeons think that their meticulous technique, while sometimes slow, gives better results even though they may require hours longer under general anesthesia. As a general rule, those surgeons who expedite the operation to decrease operative time are the safest. The only way to further increase safety is to take the general anesthetic out of the picture. Interestingly, using local anesthetics and regional blocks requires an entirely new skill set and, most importantly, it requires patience. Adding sedation in the form of oral medication helps to make the experience more comfortable, but adds very little to the complication profile as these are the very same medications we use in our post-operative outpatient patients. We have found that the intravenous use of medications such as versed and morphine creates large increases of medications with a short half-life and is more likely to cause nausea and vomiting. Nausea is a much less common problem with oral medication especially if Phenergan or Zofran are used with the pre-operative oral medications. In the past, the major complaint with local anesthesia with or without oral sedation is that it can burn when injected. There are a number of techniques that surgeons can utilize to make the injections much less painful. Almost all of these techniques require only a bit of patience from the plastic surgeon. The most commonly used anesthetics are Xylocaine and Marcaine. Due to the acidic pH of Xylocaine, most surgeons have for years added bicarbonate to decrease the “burn” when injected. The problem with adding bicarbonate is that it decreases the ability of the Xylocaine to work as well and may require a larger volume of injection. Knowing the details of Xylocaine led to a search for better anesthetics. Our search led us to Paris, France where we discovered Septocaine. We found that Septocaine has about the same complications and dosage profile as Xylocaine. The difference with Septocaine is that it is less painful to inject, it tends to work faster, and provides what patients describe as a more “intense” numbness. We have used Septocaine as a primary local anesthetic for over 10 years and I am sure it is more comfortable for the patients. The downside is that it is more expensive to use. This is a small price to pay for patient comfort. It is important to understand that the reason for all of this discussion is to make sure our facial plastic surgery patients are comfortable, pain-free, and safe while having facelift surgery and eyelid surgery. From a medical/surgical point of view there is a very specific and important reason to use local anesthetics and oral sedation rather than general anesthetics. We are convinced that the vast majority of post-operative facial swelling after facelift surgery is caused by transient but significant changes in blood pressure during and immediately after surgery. In fact, I believe most hematomas and swelling occur in the period of time after the procedure is finished during the period of time when the patient emerges from general anesthesia. We believe that controlling the blood pressure at pre-operative levels throughout the operation and especially at the end has decreased swelling post-operatively dramatically. Blood pressure control and the judicious use of epinephrine in our local anesthesia with complete patient monitoring has completely changed the first 24 hours after surgery – much less bruising, swelling, hematomas. One might ask why everyone who does facelifts wouldn’t do it with these techniques. 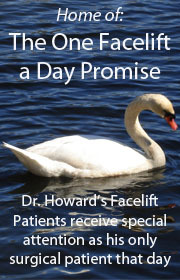 The primary reason is probably the patience it requires and the fact each facelift should be done by itself each day. This fact resulted in our “One Facelift a Day” promise. Read more about top facelift surgeon Dr. Paul Howard and his no general anesthesia facelift. First of all, what is a stem cell and why are they now so popular? One of the essential wonders of mankind is that all human beings are derived from two cells – one egg and one sperm cell. These two cells and their DNA become a single cell which divides and subsequently differentiates into all of the individual cells which comprise the human organism. As the early cells divide to reproduce themselves some of them begin to differentiate into the cell lines that form different parts of the body as well as the blood flowing in our veins. These cells which are only partially differentiated and still have the potential to become more than one type of cell are called stem cells. If these cells are liberated during the embryonic phase of development they are called embryonic stem cells. If the embryo is allowed to grow and the cells differentiate further the cell lines become more specific to each body part. As these cell lines develop into their structures (skin, muscle, fat, blood) they lose their ability to reverse course and again become “pluripotential” stem cells. Once they differentiate down their pluripotent lines they become more and specific as to their ultimate destination (i.e. skin, blood, brain, muscle, fat). These slightly more differentiated cells are called multipotential stem cells and include our now famous adipose (fat) derived stem cells. Think of this process as a gently flowing river – if one puts in and is slowly taken downstream there will come a point where it is not possible to paddle back upstream to the starting point. As we travel further downstream, our momentum increases so that it becomes less possible to reverse course. At this point where reversal, or in the cellular world – re-programming, becomes impossible, you have multipotent stem cells. A little further downstream you have more specific adipose derived stem cells which after transversing a white water rapid becomes the fat cells and fatty tissue. The fat tissue itself is the end of the river as it flows into the sea. Luckily each part of our body retains a few less differentiated multipotent stem cells so that the end tissue (fat in this case) can keep renewing itself as cells live and are programmed to die (apoptosis) and be regenerated by fat cell division and adipose stem cell differentiation. As much as we wish our excessive fatty tissue would die off, it would be catastrophic to our health as fat cells have been shown to be highly active and responsive to many chemical, protein or hormonal stimuli. So, some fat is good and too much is not so good! skin. The rejuvenation and thickening of the skin is primarily due to the increased collagen synthesis. The possible addition of activated platelet rich plasma (a-PRP) may help to enhance even further the tissue response to fat grafting. If I lost you at the river metaphor, I can summarize that the addition of science to the art of facial rejuvenation will yield some miraculous rejuvenating effects simply by understanding the biology (science) behind the plastic surgical art.